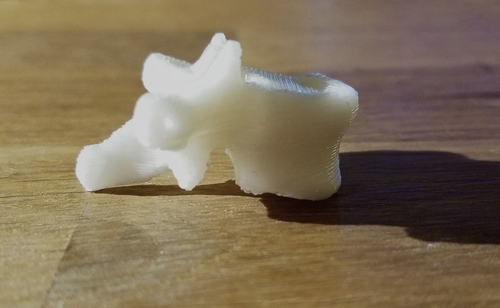 This 3D printable STL file of the cervical spine was generated from real CT scan data and is thus anatomically accurate as it comes from a real person. It shows the relationship between the skull base and the C1 and C2 vertebrae, as well as the alignment and position of the cervical vertebrae. Perfect for education. Download is free for registered members. This file was originally created by Dr. Bruno Gobbato, who has graciously given permission to share it here on Embodi3D. Modifications were made by Dr. Mike to make it suitable for 3D printing. 3D Medical imaging data was obtained in the .stl format. The hyoid bone was localized from the .stl --sectioned off in the software -- and that part of the anatomy was revised using 3D modeling techniques to be highly adaptable to 3D printing platforms for potential regenerative medicine applications. This hyoid bone re-topology was performed by Chris Leggett. It is free to use for research purposes, with modifications as needed, and any future clinical purposes with standard citation practices for using this material and under the creative commons attribution license. This 3D printable L4 lumbar vertebrae was generated from real CT scan data and is thus anatomically accurate as it comes from a real person. It shows the anatomy of this low back bone. Download is free for registered members. This anatomically accurate L3 vertebra was extracted from a DICOM CT dataset (0.5 mm slice thickness x 95 slices). The model may be useful for medical education and shows shows the vertebral body, spinous process, facets, transverse processes and spinal canal. The file is in STL format and compressed with ZIP. Printed on a Makerbot Replicator 1. Thank you to Dr Mike for the excellent renders. This is a .stl file produced from a CT scan of myself. I used 'InVesalius 3.0 free' to convert the 2D dicom images into the .stl file. I use either 3D Tool or Materialise's MiniMagics (free versions) to view and manipulate the 3D image. I have been told I had a severe hyperflexion injury to my c spine during an assault in 1988 and sustained a number of fractures and subluxations which were not diagnosed by a hospital as they discharged me from the ER in error before I had been examined by a Dr. It wasn't until I had a CT scan in 2011 and produced 3D images from it that I discovered various bony abnormalities that were subsequently identified as fractures & subluxations by experts. I understand the right transverse process of T1, tip of C6 spinous process and the left greater cornu of the hyoid bone are the most obvious old fractures that can be seen. This STL file of the cervical spine was generated from real CT scan data and is thus anatomically accurate as it comes from a real person. It shows the skull base, part of the mandible, and cervical and upper thoracic vertebrae. Download is free for registered members. This anatomically accurate C1 vertebra was extracted from a DICOM CT dataset (0.5 mm slice thickness x 47 slices). This anterior wedge compression fracture of a lumbar spine vertebral body was generated from real CT scan data and is thus anatomically accurate as it comes from a real person. It shows the loss of height in the anterior vertebral body when compared to the posterior part of the body. This type of fracture is common with forward flexion, such as a from a fall or motor vehicle accident. This anatomically accurate acetabulum was extracted from a DICOM CT dataset (0.5 mm slice thickness x 132 slices). The model may be useful for medical education. The file is in STL format and compressed with ZIP. The two hip bones are related anteriorly by the symphysis pubis and posteriorly to the sacroiliac joints bilaterally. 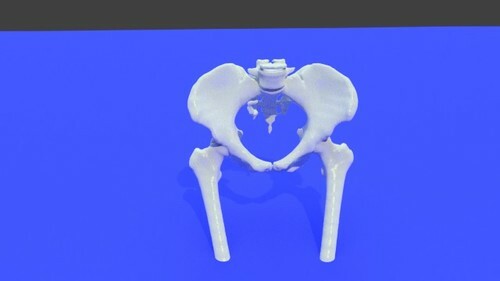 This model if for a 24 years old female pelvis, it shows some irregular shaped pieces related to the contrast media within the colon as well as the upper halves of the femoral bones. This 3D model was created from the file STS_036. The source CT scan used to create this model can be found here. This anatomically accurate ilium was extracted from a DICOM dataset (1 mm slice thickness x 90 slices). 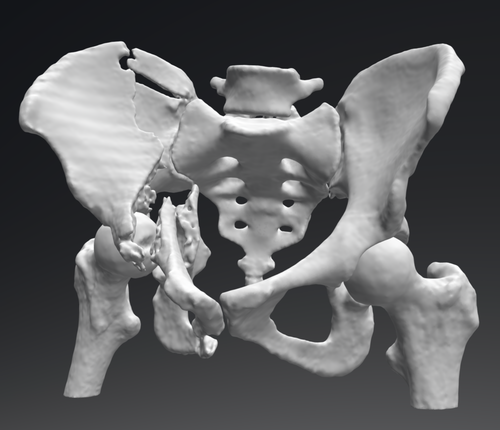 The model may be useful for medical education and shows shows the iliac crest nicely. The file is in STL format and compressed with ZIP. This anatomically accurate sacrum was derived from a DICOM CT dataset (0.8 mm slice thickness x 138 slices). The model may be useful for medical education and shows the sacral foramina, dorsal and ventral surfaces, and articular surface with the L5 vertebra. The file is in STL format and compressed with ZIP. This 3D printable STL file of the thoracic spine was generated from real CT scan data and is thus anatomically accurate as it comes from a real person. It shows detailed anatomy of the thoracic spine, including the relationship with the ribs. Download is free for registered members. The sacrum is the lower most segment of the vertebral column and also forms the posterior wall of the bony pelvis. The sacrum is formed by five fused sacral vertebrae. This model shows the origin of ribs, few of the cervical spines and the sacroiliac joint. The minimal tilt seen is likely positional rather that pathological. This 3D model was created from the file STS_036. The source CT scan used to create this model can be found here. This anatomically accurate ischium was extracted from a CT DICOM dataset (1 mm slice thickness x 38 slices). The model may be useful for medical education and shows shows the ischial tuberosity. The file is in STL format and compressed with ZIP. This is an STL file of two lumbar vertebrae from a CT scan. The STL file is raw and has not been edited to remove extraneous geometry. Since the CT scan it was taken from had IV contrast, the lumbar arteries are visualized and can be seen wrapping around the vertebral bodies. 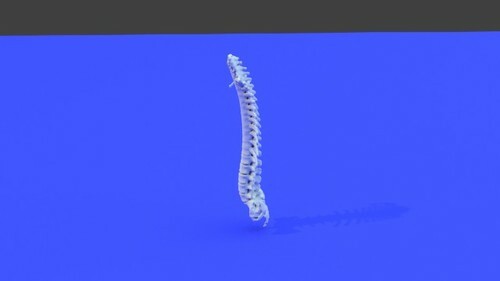 This 3D printable STL file of a thoracic spine with severe scoliosis was generated from real CT scan data and is thus anatomically accurate as it comes from a real person. It shows how the vertebrae become misaligned in the scoliotic spine. Great for education at all levels. Download is free for registered members. This file was originally created by Dr. Bruno Gobbato, who has graciously given permission to share it here on Embodi3D. Modifications were made by Dr. Mike to make it suitable for 3D printing. Acetabular fracture of the pelvis. CT scan, 2mm slides. Pelvix set, Osirix dicom library. A thoracic vertebra generated by using the contouring tools in 3DSlicer and smoothed in Blender. TC extracted from DICOM file.